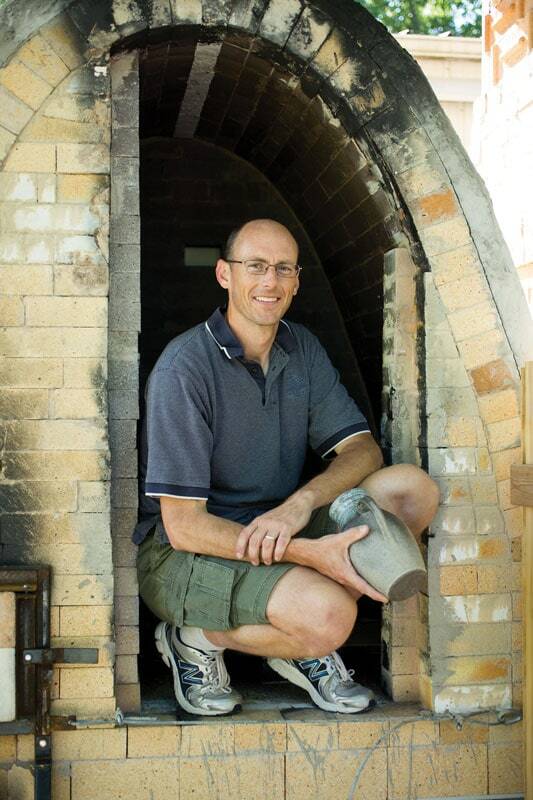 Jeffrey Ferguson, a doctor of anthropology at the University of Missouri, could say the same, although the pottery he creates in his backyard studio looks to be the work of not just a “passionately curious” person, but also someone with an eye for grace and detail. Not being one to leave his work at the office, Jeff researches the origins of ancient obsidian pottery of the Mesa Verde region by day and then comes home to make his own dishes and vases. But that is only one of his passions. While most of us wonder, observe and may be satisfied with a tour of a pottery factory or a brief article about mushrooms from a conservation magazine, Ferguson is a relentless doer — he’s more inclined to pursue the art of making the pottery and actually growing the mushrooms. To watch a documentary on honey bees would not satisfy the busy Dr. Ferguson. He must build with his own hands the boxes and raise his own colonies. Jeff is the quintessential renaissance man up the street. He is the father of four and is married to Susannah, who holds three graduate degrees herself. The Ferguson brood is growing up in what they don’t realize is quite literally the land of milk and honey, with roots in ancient history. While their mother grows vegetables in their vast gardens, their father can be found most any evening using his hands and a pottery wheel to create what humans have been making for thousands of years, or he might be seen in full netting cultivating an insect that has been doing quite fine for perhaps as long as 14 million years. A few feet behind the pottery workshop are the ducks and chickens, with dinosaur ancestry, laying two or three dozen eggs daily for the family and their small network of buyers. Walk another 20 yards or so and you’ll encounter the neatly stacked mushroom logs, where Jeff has mastered the task of inoculating, growing and harvesting shitake and oyster mushrooms, as Louis the XIV is believed to have done. Jeff explains how the bees vibrate their muscles to the extent that the hive will maintain a temperature as high as 95 degrees, even in the winter. Outside, they “dance” to notify other bees of a food source. The waggle dance, as it is known to beekeepers, isn’t your average two step. It is a figure-eight movement, done in the direction of the food source. The duration of the dance tells the other bees how far away the food is, possibly as far as two and half miles, which they can fly in a matter of minutes. Recruiting fellow bees to go forage (locust flowers are a favorite), benefits the whole hive, which is what being a honey bee is all about. These little buzzing insects are committed team players. Jeff likes to share his honey bee hobby with others by helping them start their own colonies with his starter hives, called nucs (short for nucleus). He’s helped to start colonies all over Columbia. His starter nucs contain 10,000 to 15,000 bees and one queen in a miniature cage, with a marshmallow door to start. Why a marshmallow door? Jeff explains that in the amount of time it takes the worker bees to eat the door away, they have hopefully accepted “her royal highness” as their queen, thereby letting her lay as many as 2,000 eggs a day — and almost a million during her three- to five-year lifespan. 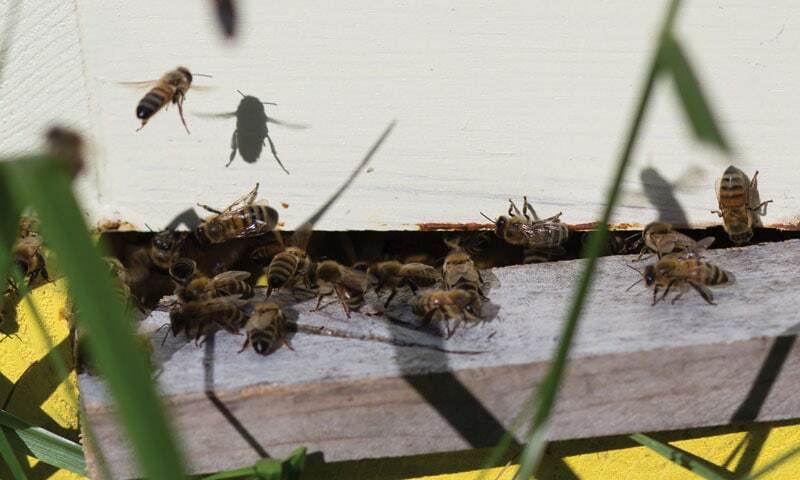 Hosting bee hives has become something of an environmental good deed with climate change and the damage caused by the pesky varroa mite, which was brought to Florida in the 1980s and has been invading hives and hurting bee populations ever since. Squashes, potatoes, broccoli, cauliflower, celery, peppers, oranges, strawberries and many other crops and flowers rely on bees for pollination, so the health of bees as a species is vital to the human race. Indeed, beekeeping in a backyard brings wonder, delight, honey and yes, an occasional sting during the bees’ lean months if you aren’t careful. But a sting here and there is not enough to discourage a passionate keeper like Jeff. All in all, a visit to the Ferguson homestead is a reminder of the power of curiosity when it is given license to thrive. It can transform a backyard into a classroom for all ages, with the added benefit of bringing fresh food and flavors to the dinner table from just a few steps away. The Ferguson kids are lucky to live with the ducks and the bees, and parents who know a thing or two. With a little time and luck, someday they might recall the buzzing of the bees and the crow of the rooster with the same childlike wonder their father has for them. But for now, their backyard isn’t special — it’s just home, and the bees buzzing by on their way to the locust flowers are just Dad’s bees. And that’s ok. In fact, it’s perfect. I left the Fergusons’ with a bag full of fresh oyster mushrooms and a few dozen eggs, and challenged myself to pair them with honey. My garden had a lovely crop of roquette, which I discovered in London a few years ago (only to learn that it grows happily in Missouri and is commonly known as arugula!). Most people don’t have to leave the country to discover a crop their neighbors are growing but I figure that gives me license to call it by its French name. Roquette has a peppery taste, and so I love to pair it with sweet foods like dried cranberries or, in this case, a honey–balsamic vinaigrette. Whisk the following: 1 part honey, 1 part grapeseed oil, and 1 part balsamic vinegar. Pour oil in a large pan on medium high heat. Whisk the eggs, beer, honey, salt and pepper together in a small bowl. Clean the oyster mushrooms by removing them from their main stem (leaving small stems intact) and wiping clean with a paper towel. Test the oil with a drop of batter. If it floats and sizzles, it is ready. Do not heat the oil so much that it smokes. Coat your mushrooms and drop them in the oil, and turn as they brown. Drain on a plate of paper towels and continue until all are done. Serve hot over a bed of roquette and drizzle with the honey balsamic dressing.